Grafted Tree. This is a very good longan from Northern Thailand, with crispy texture. A mid-season, very sweet, cultivar for non-tropical climates. The foliage is very ornamental and it makes an excellent garden tree. 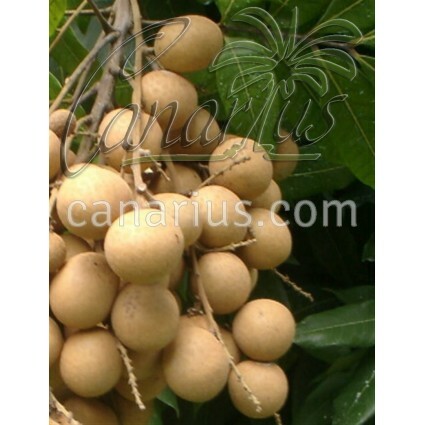 Longan is an excellent sweet fruit related to lychee. Dimocarpus longan is a tree native to Subtropical China and South East Asia. It has a sweet and musky, grape flavour. The foliage is very ornamental and it makes an excellent garden tree. It needs frost protection but it can grow in the warmer Mediterranean coastal areas. This is a very good variety from Thailand with crispy texture. Chompoo, or Sri-Chompoo, is a mid-season longan cultivar. The fruit is of medium size, oval in shape and with greenish light brown skin. The seed is small and the aril (flesh) is thick and slightly pink and thus the name 'Chompoo' meaning pink. It is very sweet and has a pleasant aroma. The cultivar is normally grown in the northern provinces of Thailand, where the cool winter months are necessary for induction of flowering. The weakness of this cultivar is said to be its irregular cropping habit as a result of poor flowering. Nevertheless, in the cool subtropical conditions of the Canary Islands, we see it is very regular. For high production, the tree requires high fertilizer application and good management. We offer a potted grafted tree, about 40-70 cm tall.